A great playing and sounding strat with everything you need to start today. There's no easier and more affordable way to get started on electric guitar than this value-filled Squier set. 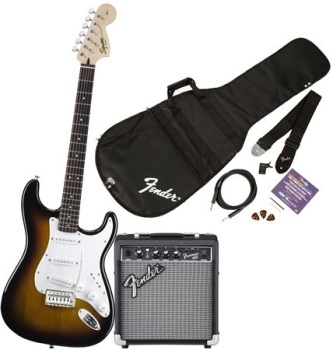 Opening this box opens a whole new musical future for you, with a great-sounding, cool-looking and easy-playing Affinity Strat guitar, a compact 10-watt Fender Frontman 10G amp to plug it into and all the accessories you need, including an electronic tuner, instructional DVD, gig bag, cable, strap and picks. Squier Affinity Strat is available in Brown Sunburst, and features three singing, sparkling single-coil pickups on a classic single-ply white pickguard, rock-solid bolt-on maple neck with rosewood fingerboard, skirted white control knobs and a sharp new gold-and-black Squier headstock logo. Fender Frontman 10G amp features custom-voiced built-in overdrive for natural grit and adjustable gain control that rocks guitar tones from tube-emulated overdrive to full-strength ultra-saturated distortion (perfect for blues, metal and the famous Fender clean tone), along with volume, treble and bass controls, 6" Special Design speaker, closed-back design for heavier bass response, auxiliary input and headphone jack, and classic black panel/skirted knob/silver grille cloth looks. You get guitar, amp, accessories and instruction all at once, and more than ever it's everything you need to Start Playing!